As of January 2013, there are 568 Authorized Sellers of Poison (pharmacies) in Hong Kong. Of these, 94 are chain pharmacies operated by two corporations. 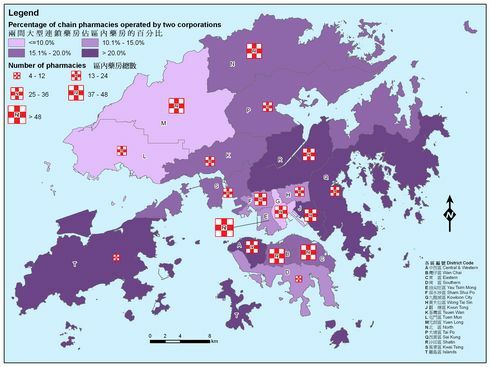 This map shows the distribution of pharmacies in Hong Kong and the percentage of chain pharmacies by district. As indicated by the "Rx" logo, Yau Tsim Mong has the highest number of pharmacies. More than a hundred pharmacies can be found in this district. Less than a dozen pharmacies are located in Southern and Islands. The graduated colours shows that the percentage of chain pharmacy is the least for Tuen Mun, Yuen Long and Kowloon City. Percentage of chain pharmacies is higher in district with recently developed new towns such as Tung Chung in Islands District, Tseung Kwan O in Sai Kung District and Ma On Shan in Shatin District. Data for the map were obtained from Drug Office, Department of Health, HKSAR Government. Authorized Sellers of Poisons (ASP) are usually known as pharmacies or dispensaries. Each ASP is allowed to sell prescription medicines under the authority of a prescription with the supervision of a pharmacist, who will be on duty at specified hours. This type of medicine shops is allowed to use or display the "Rx" logo. Listed Sellers of Poisons (LSP) are also referred as "medicine stores". There is no pharmacist on duty in LSP. For LSP, sale of pharmaceutical product containing Part I poisons and use of the "Rx" logo are prohibited. However, LSP are authorized to sell non-poisons or Part II poisons, such as cold and flu medications. The general public can find all the registered pharmacies (ASP) in the website of Drug Office.